Two years ago, I-44 Speedway in Lebanon, Missouri teamed up with the JEGS/CRA All-Stars Tour to host the country's biggest Pro Late Model paying event. The winner would receive a check for $8,000 and a green jacket, just like the winner of The Masters receives at the famous Augusta, Georgia golf course. Last year, it was Georgia native and current NASCAR Nationwide Series point leader Chase Elliott winning the inaugural event. This year, it was Suwanee, Georgia’s Anderson Bowen taking home his green jacket and keeping this event’s winnings in the Peach State. 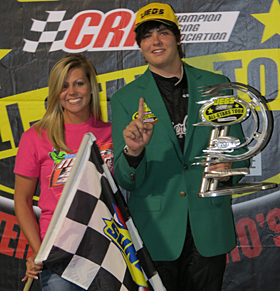 “It’s nice that the Georgia boys swept both years,”Bowen said after his win on Saturday night. “That green jacket, it is nice to have that in the collection. 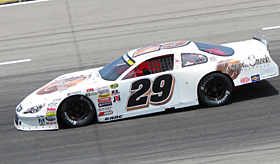 Bowen took the lead with 44 laps to go in the 144-lap event and held off Dave Gentile for the win. One concern Bowen had was holding off Gentile on the restarts. The victory was much needed for the 16-year-old driver. Last year, he was sidelined with injuries and needed a win to help with his confidence. “Last year, breaking my ankle and then fracturing my knee at Martinsville, it was really a rough year mentally and physically for the team,” Bowen said. “To come back and rebound this year along with winning a race early in the season is a huge relief. Bowen will now get back behind the wheel of his Super Late Model and prepare for the second Southern Super Series Gulf Coast Weekend. On Friday, he will be at Five Flags Speedway in Pensacola, Florida and Saturday at Mobile International Speedway in Mobile, Alabama. Bowen is currently third in the standings with four top-fives in five events. He feels that the win this past weekend will give him great momentum leading up to this weekend’s two nights of racing. Anderson Bowen will take the green jacket back to Georgia. Bowen broke the track record in time trials.